Nektan’s Get Fruity game has a really classic feeling to it, but it is designed to play smoothly on all the latest wireless handsets including Apple, Android, and Windows and Blackberry options. The slot has been optimised for finger control on touch screens, and its simplest graphics and features mean it will lay smoothly on any smartphone or tablet. 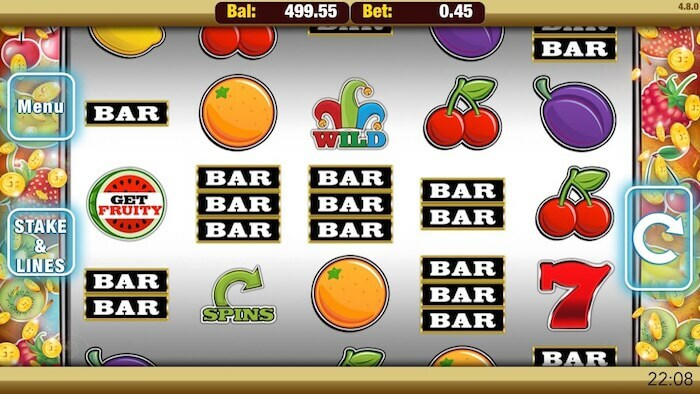 Although Get Fruity is a smaller game than you might choose to play on your desktop computer, it still features a Wild Symbol and a Scatter Symbol, which can both really boost your payouts. The Wild is depicted with a quirky jester’s hat, and can stand in for any regular reel icon. This will help you to complete many more paying combinations. The only symbol that the Wild can’t substitute for is the Scatter, depicted by a simple Free Spins sign. You’ll get 10 free spins to start off with and they can be indefinitely retriggered, so things can get very lucrative during this Canadian online slots round. With the pared-down mobile action of the game, it’s the Wild and the Scatter features that will help you win the most money. The Get Fruity slot is a good choice for busy players who are always on the go and need to grab their spinning action wherever they can. It’s solid gameplay and smooth functionality deliver rewarding experiences. The uncomplicated 2-D design works well on the smaller screens of handheld devices, with the classic and brightly coloured plums, oranges, lemons, watermelons, 7s, bells and single, double and triple bars on the reels adding to the vintage feel of the game. While the gameplay is quite basic, it’s still pleasingly immersive and can offer some great rewards. This game has 5 reels and 9 possible paylines, with the bets on each activated line ranging from 0.01 to 1.00. This means you can bet as little as 0.01 and as much as 9.00 on every spin. The aim is to line 5 symbols up in a row across the reels, to activate payouts that are multiples of your line bet. The minimum multiplier is 50x for 5 single bars or cherries, while the maximum jackpot is 2,500x for 5 watermelons. In between, you can get 110x for double bars, 150x for triple bars and plums, 300x for lemons and 500x for oranges. Bells and 7s will bring multipliers of 750x and 1000x respectively when 5 of the icons assemble in a consecutive row. The theoretical RTP of the Get Fruity slot is an impressive 96.34%, but you can also choose to play it free for no deposit. This is helpful if you want to investigate the game or practice your technique and shore up your confidence, and it’s great when you want to spin without any stress as well. When you’re very pressed for time but want to make the most of your winning opportunities, you can also activate the Auto Spin feature to turn the reels automatically up to 100 times.